Boats. They have been a part of Minecraft since Alpha 1.0.2, but they have changed little since they were added to the desktop version. Pocket Edition has seen some variation, with oars and new wooden models, but functionally, boats are almost exactly how they have always been - fast, reasonably cheap to make, and almost irrationally flimsy. Hit the shore with your boat? It shatters. Hit a passing squid with your boat? It shatters. Sail within 500 meters of something in multiplayer? Shatters. At times, the noble and majestic boat is almost more trouble than it's worth. Boats are exceptionally useful on the open ocean. Even dropping a 1x1 land-bridge as the player walks isn't as fast, and takes more resources. The trouble only really begins when it's time to make landfall. Other than soul sand (or a carefully positioned chest), boats cannot run into anything at any appreciable speed without exploding into parts. It is perhaps because of this that boats see very little use outside of niche applications in custom maps. This begs the question: what would be an ideal fix for boats? Making them invincible is impractical, since nothing else in the game shares that property. While it would be nice to slam into the shore at 100 knots without consequence, it just doesn't fit the theme of the game. One suggestion included having boats use a durability rating, like tools, with a fixed amount of damage they can suffer before breaking, while being fixable with tools and materials. A somewhat simpler solution offered that boats simply have a higher durability, so they are not so fragile. Another possibility is having the boat drop itself, instead of wood and sticks, when it "breaks" on something. There are many possibilities for making boats better, each with their ups and downs. If it were up to you, what would you change about boats? That's another great point. I had forgotten that this change was made. I am ALMOST tempted to say "OBJECTION!". Unless you are pressing W, A, S, or D, you actually have MORE viewing freedom than the new Left|Right controls introduced in the Win10 and PE. Boats also have a lot of momentum, so you can let go of the W key for ~20 seconds before the boat slows back down. "Making them invincible is impractical, since nothing else in the game shares that property." Um what about minecarts? They are practically invincible. Only dropping them into lava and maybe tnt (haven't tested) will destroy them. Rewrite those big wooden bowls, make 'em moar complex, yarrr. Oars, sails, I dunno. Expensive craft, durability bar, repairing, make 'em able to store items. And ships. We need ships. Let's raid those villagers yarrr! W8, where's mah parrot? How about we do the thing where we make players and boats one entity, and add an entirely new boat altogether, called a raft, bigger, doesnt break, goes a little slower, easier to steer maybe? Because if you added a raft it would give you an excuse to experiment with new mechanics and systems of behavior, without having to worry about BOATS per se. And since it would be new, it could be in "beta testing" as long as you wanted, and just use it as a place filler for experimental boat mechanics. You can already stand on boats, so why not add a 2x2 or 3x3 or 4x4 raft that multiple people can stand on? or sit in. I would say to make it so you could build on it, but i know that you start running into entity problems, and there are mods for that anyway, so that isnt a big necessary feature. 1. Add durability. Doesn't have to be a lot but the damage the boat can take depends on the speed of collision when it runs into something. Boats should be able to handle at least one full speed collision without breaking. 2. Adjust Squid AI. Make Squid swim AWAY from boats. Or at the very least make squid stay move and stay out of the top block layer in bodies of water when a boat is within a given range. 4. Allow leads to attach to boats, for docking or to tug another boat behind you, becomes especially useful if boats could also carry mobs. 5. Either allow Minecarts to act like boats in lava, or add another type of boat that can safely float in lava. they were so much more usable when they were clientside. True, other users couldn't see your boat, but you could steer it around without lag (like walking). Back when water elevators were a thing (and before carts worked in MP), sky canals were the main mode of transportation on our server. Those were only possible with the boats being clientside. Moving them serverside and subjecting them to lag would have made our narrow sky canals impossible to use, but that's OK, killing water elevators did that too. The soul sand thing is a complete myth; boats do break apart when colliding into soul sand. I'm pretty sure they always have. Perhaps instead of all these workaround solutions, maybe we could address the real problem; The desync issues. Boats wouldn't break nearly as often if we actually knew where they were, since as it stands, we just can't slow them down or dock them reliably because we literally have no idea where they are. I have thought about this a lot since playing Minecraft. It is not right that a boat breaks so fast and easy, but when I got to thinking about it. The boat is made soulfully out of wood, so they creators probably thought about making it like a raft type thing. Wooden rafts do fall apart easily since they are a lot of time held together by twine. Twine is not the strongest of ropes, but it use to be use a lot to hold rafts together back in the day. Thinking like this lead me to think that our boats in Minecraft are created around the possibility that they are supposed held by twine. (Sorry, over active imagination on this one.) Not, I think if we could add some iron to the build we could make a stronger structurer of a boat that is harder to break and should use durability like tools and armor. I do not know if it should be a block or iron or a bar, but to me, I think adding iron to it should make it stronger. I also do not know if you should add the iron in with the current recipe, which if Mojang does that, I think it should use bars, or if you should create a boat first, put it back in the crafting table with an iron block next to it and pull it out to make it, if Mojang did this. I have thought before in the past about asking for someone to create a mod around this to make a basic Minecraft boat stronger, but I thought no one would do it, so I think Mojang should. Lets face it the steering of said "boats" ,are terrible. like the horses they don't depend on what direction you are looking So Ill like the steering of the boots to be fix to that point. Boats are awful. The combination of fragility and the desync issues mean it's practically impossible to navigate rivers with them, or build usable canals, or really do anything with them. This is probably the most glaringly obvious problem in MC. The boat desync issue is here on the bugtracker. Everybody who thinks this is a big problem should go there and upvote the issue. Troll solution: add chest and inventory slots to boats and let squids still break them. Just imagine the rage when your filled boat breaks in the middle of deep ocean and spreads all your precious stuff over ocean floor giving you five minutes to recollect them. Umm... you do realize that boats dropped themselves back when Minecraft was still in beta right? The reason they changed this was because you had no consequences for breaking your boat. Anyways, i do like the idea of durability, and it would also be nice if it showed up like a horse's life bar. If they were able to support different wood types, that would be great. Maybe getting rid of the 'boat abandons you in the middle of the ocean' glitch. I've lost a hundred boats because of this! The chunk loads, then your boat seems to load at a later point, making it reappear back in that chunk, even if your almost a kilometer away. What about some duct tape programming? When you click the boat, player teleports to its location, the boat disappears and player recieves the "boat item" as part of equipment (with its own mesh), player's animation changes to "sitting" mode. Player becomes unable to dive into water, jump or move onto solid surfaces, but can slide on the water. When player "exits" the boat, the boat entity spawns on player's location and the "boat item" disappears from player's equipment. So it won't twitch/lag cuz it's a part of player (just like armor), and still can be seen by other players in SMP. 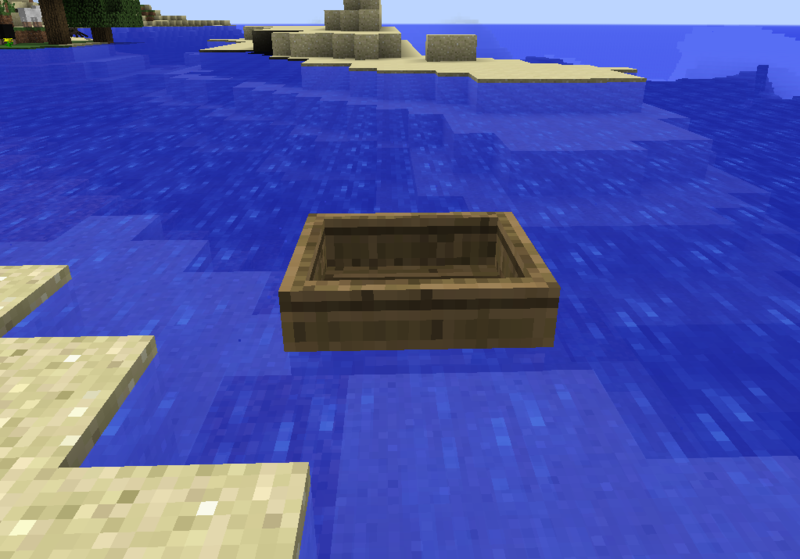 I believe that placed boats should be entities but once right clicked instead of the player mounting the boat entity the boat should be despawned from entity form and equipped to the player in an armor slot that is not displayed in the inventory, when this boat is equipped it allows the player to move in water as if they were mounting the boat entity. Of course with this equipped the player can not jump or leave the water, on dismount the boat should be spawned back as an entity next to the player. I think this could potentially make the boat mechanics less buggy and prevent desyncing to an extent since the boat would be a part of the player. There could potentially be a boat durability bar somewhere when it is equipped or moused over aswell.